Just below the surface of the waters of the Hood Canal, a whole new world exists waiting to be explored. It is carpeted with sponges and seaweed, populated by wolf eels and octopus and visited by the occasional seal and even (rarely) a six-gilled shark. The cold water of the Pacific is daunting, but the variety of marine life it holds is well worth the chilly SCUBA dive. 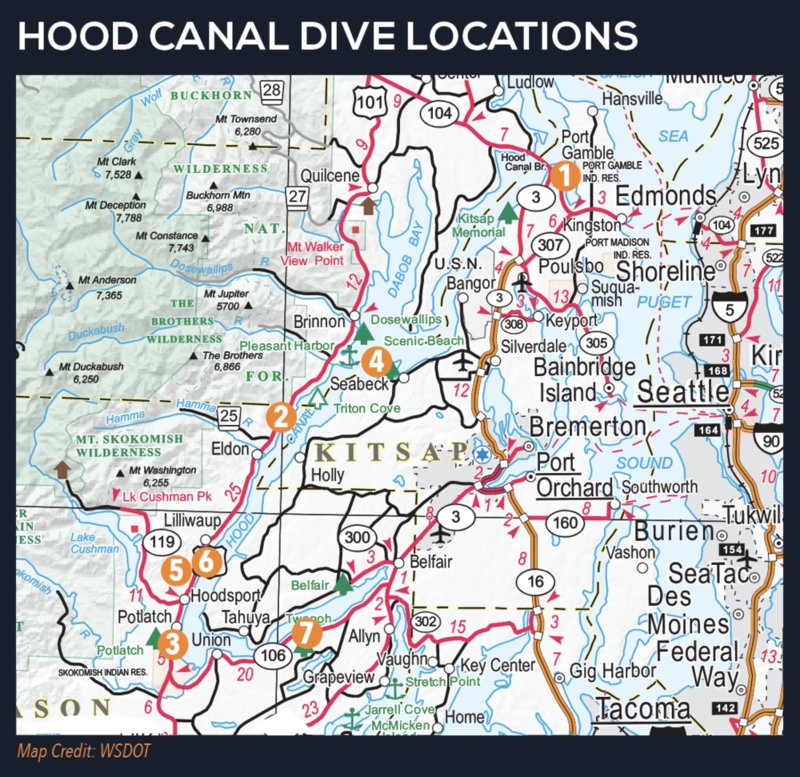 With its comparably slower currents (to the rest of Puget Sound), the Hood Canal offers many opportunities for shore dives and boat dives of various experience levels. Winter to early spring offer clearer visibility as the cooler weather means less algae blooms. Check with local dive operators on current visibility. Following is a list of the top dive sites of the Hood Canal as rated by Betty Pratt-Johnson’s 141 Dives in the Protected Waters of Washington and British Columbia (1977); Stephen Fischnaller’s Northwest Shore Dives (2000); as well as diver’s blog reviews, including Scott Boyd's Emerald Sea Scuba and Nicolle Prat's Pacific Northwest Scuba. This is a more intermediate shore dive requires you time the swim out to the dive area right before the beginning of slack tide, so that the current pulls you out to the bridge, then you can save your energy for the swim back. On your swim out to the bridge you pass through eelgrass beds, which are teeming with perch, soles, shiners and other sea creatures. When you reach the concrete bridge supports you are greeted by a fantastic display of plumose anemones and many different types of nudibranchs. Be careful of boat traffic and pace yourself for the long swim to and from the bridge. Outside of Lilliwaup, just to the South of Mike’s Beach Resort (360) 877-5324, is a dive site more comfortably accessed by boat (but you can free swim to it also). Called “the knuckle,” this dive site consists of a series of rock formations, rising like a mini range of mountains from the ocean floor. Since this formation is farther out and more exposed to currents, this site usually has excellent visibility and there are lots to see. Ling cod lay their eggs at this protected site, and there are resident wolf eel and octopus populations. Since the rise of “the knuckle” is so rapid, the site can be difficult to locate — visit Hood Sport ‘N Dive in Hoodsport, (360) 877-6818 for more information as well as air and lodging! While the diving at Potlatch is less dramatic than those sites already described, if you are just getting your flippers wet, this is a great place to start out. This shore diving spot is easy to get to, has showers to wash off gear, and it is a great place to get comfortable with equipment and techniques. Like Potlatch, this site is accessible from the beach and rewarding for all experience levels. There is plenty of marine life to observe on this sandy-cobble beach, which shifts after 15 ft into a large eelgrass bed, likewise teaming with all the creatures that are heir to this environment. Although parking is limited, this wall site is easy to access from shore and gratifying for all experience levels, but it is a popular spot! Bring a flashlight, there are plenty of friendly octopuses and wolf eels. This is a protected site, no harvesting or disturbing the inhabitants (and no taking of the glass bottles that octopuses like to hide in). Easy beach access to this site is available through Hoodsport ’N Dive for $20 per diver. This is an iconic dive spot of the area. Hoodsport ’N Dive even offers classes at this site. From the beach you swim out through eelgrass environs filled with perch, crabs and other types of sea life. At Sund you are greeted by wolf eels, octopuses, sea stars, and giant cod. As a marine preserve, it too is closed to harvesting. This full service park has a gentle current, which gives divers the freedom to dive whenever— independent of slack tides. You will find a large eelgrass bed filled with fish, such as tube-snouts, black eye gobies and sticklebacks. After about 40' depth you can find tube-dwelling anemones. These anemones are entertaining to watch as they feed with their long graceful tentacles. Use a dive flag and submerge when you pass the roped swimming area. For information on these and dives and more; or to book certification, classes,and a Hood Canal trip visit explorehoodcanal.com and check out the "Scuba" link.